Aaron is a custom builder on the west side of our island. He’s one of our favorite guys, and our LR Baggs rep so he supplies us with pickups even more regularly tha ukes, but when we do get one of his it’s always a wonderful tenor with full rich tone. Just what I like. 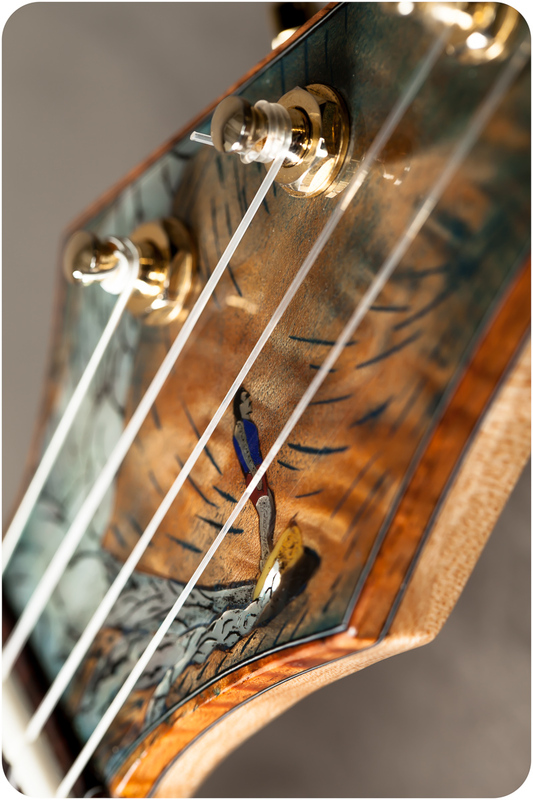 This tenor has an all koa body with rosewood bindings and an abalone rosette. Milo wood fretboard, an awesome Hawaiian wood, and Spanish cedar for the neck, strong light weight material some custom builders use. It protected with a fantastic nitrocellulose gloss finish and setup with wonderful action. The tone, as you can hear, is solid! Wonderful mid range with great clarity all across the frequencies. 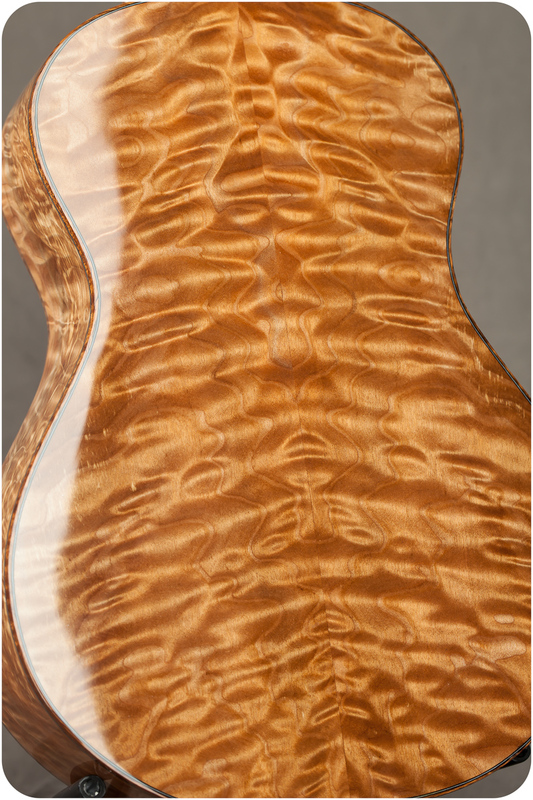 Aaron usually builds with a spruce top but this all koa model sounds excellent! This is one of the best cuts of spruce I’ve seen. Tight grained and when you see “silking” like this you know it’s perfectly quarter sawn. The koa has a very unique figuring we practically never see. Almost quilted with all kinds of stuff going on as you turn it in the light. Of course showing off and protecting the wood is a glassy nitro finish. Koa bindings, rosewood fretboard and bridge, Aaron’s own radial bent koa rosette, and a Spanish cedar neck with a carbon fiber rod to reinforce it. Aaron strung this one up with with Savarez strings and an Aranjuez wound low g.
Another perfectly quarter sawn sitka spruce top with beautiful “cross silking”, but with curly Hawaiian koa binding framing off an eye-popping set of quilted maple one the sides and back. 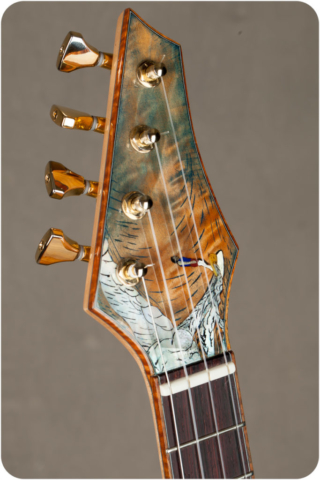 Topping it off is the one-of-a-kind hand inlay on the headstock. This was inspired by sketches that Aaron used to do in high school. Anyone that followed surfing back in the day knows of Gerry Lopez and can conjure this image of him casually taking the bottom turn on a massive wave. Aaron does a light fade to the blue waters outside the wave with this liquid curly maple. As you turn it around to look at the neck…BAM! 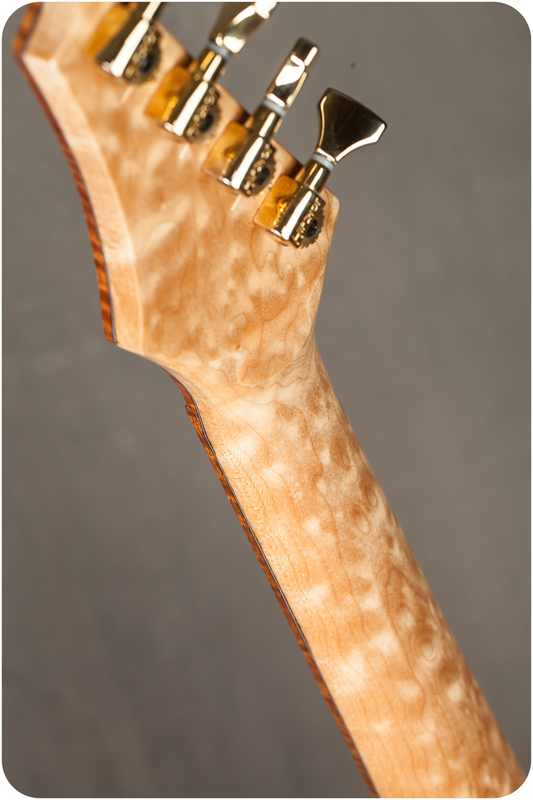 Gorgeous birdseye maple! You’ll also notice the hipshot tuners that Aaron uses for his Fender style all tuners on one side headstocks. This wood combo adds volume and focus to Aaron’s naturally warm voicing and are especially great for balanced recording. Add to that the super great playability (this uke is SO easy to play!) and it really makes for a joyful experience.